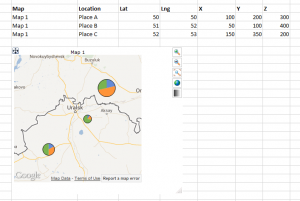 XLCubed Maps allow plotting geographic data directly in Excel and publishing to the XLCubed Web server. You can plot the data locations, and optionally set the colour and size of the plotted points to show values. To create a Map from Excel simply highlight the relevant data and select Maps from the Visualise drop-down button in the XLCubed menu. You will then be presented with the map properties dialog. XLCubed expects your data to be arranged in a particular way to create maps. Generally there should be several columns of data as described below. The columns should contain the following. Location Name Title of the data point, shown when you hover over the point. Latitude Latitude of the point. Longitude Longitude of the point. Colour (optional) Defines the colour of the point plotted, can be a number or text. If no column is selected then all points will be the same colour. See Colours for more information. Size (optional) Defines the size of the point, this must be a number. If no column is selected then all points will be the same size. If you do not know the latitude/longitude you can look it up using the Extras -> Lookup Latitude/Longitude menu item. Highlight the place names and select the menu item. This can take some time, so is not available as a function. It is recommended you look up the locations once and then reference them, for example using the VLookup() formula. Named places uses a predefined set of codes to identify locations. You can then plot either the outline of the location of a point in its center. XLCubed comes with defined outlines for many common requirements. You may also add custom sets of locations, to do this please contact support@xlcubed.com. The columns for the report should contain the following. Location Name Name of the place to plot. For named places you can choose to display the outline of the place rather than just a marker at its centre. As of Version 7.6 you can customise the transparency of the shape and border. Toggle map display type. Switch between road and satellite views. Toggle fade map. Fading the map makes the data points more prominent. Right clicking on the map and selecting 'Edit Map' brings up the map properties dialog. If your data includes a colour column, this column can contain numbers or text, and there are three ways the values could drive the colour. Colour Gradient: if you have numbers the colours can be from a colour gradient. E.g. Red-Green shading for negative/positive margins. Categorise: you can categorise each point with a number or text. For example, if mapping national stores, the colour column could contain the store type. Each store type would then be plotted a particular colour. Named Colour: the column could contain specific colours, using named colours or Html syntax such as #ff0000. This allows you maximum flexibility to drive the colour using any criteria you choose. Icon: you can map each location with an icon. The colour column would need to contain the file name of the icon to be used. If no size column is found then all markers will be the default size specified in the map properties. If a size column is included then the size of the marker will be between the Low and High value sizes specified in the properties screen. The exact marker size is calculated by interpolating between these values. In the properties screen you can set up "output cells" for the map and location names. With these selected clicking a data point will update Excel. This can then be used to drive a detailed report for the selected point. If you turn on multi-select and pick an output range rather than a cell you can output multiple values. Drawing tools appear on the map to allow you to pick many points, and OK the selection. Starting in Version 7.6 you can plot pie charts instead of simple points. In this case, columns after the location column will be used as data values for the pie segments. By default the size of the pie chart will be based on the total of all the data values. You can optionally set the last column to be the pie chart size. This allows you to control the size based on another parameter, or make all the charts the same size (by filling the final column with 1s). These options are new in Version 7.6. Zoom to fit - Matches existing behaviour, map is zoomed and scrolled to show all data points. Save on close - The zoom and scroll are saved with the workbook. Custom view - You decide the zoom and scroll, click the "Set" button to select the current view. These settings allow you to customise the map layers, such as road, water and place names. You can adjust all the layers at once, or individually. Click the "Apply" to see a preview of what the map will look like. This page was last modified on 23 May 2018, at 15:30.